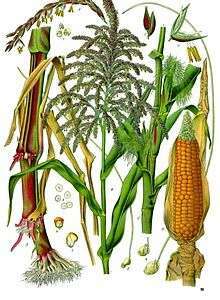 This article is about plants in the family Poaceae known as grasses. For other uses and meanings of "grass", see Grass (disambiguation). Poaceae (English pronunciation: /poʊˈeɪ.siˌiː/) or Gramineae is a large and nearly ubiquitous family of monocotyledonous flowering plants known as grasses. 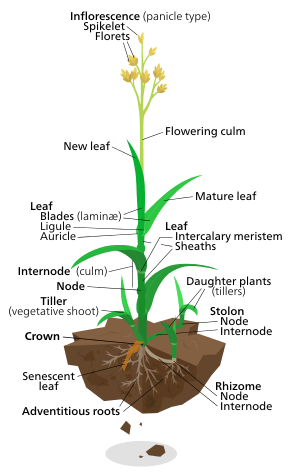 Poaceae includes the cereal grasses, bamboos and the grasses of natural grassland and cultivated lawns (turf) and pasture. 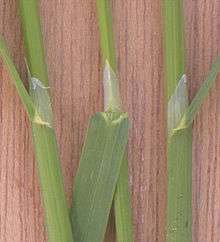 Grasses have stems that are hollow except at the nodes and narrow alternate leaves borne in two ranks. 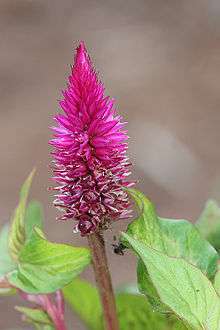 The lower part of each leaf encloses the stem, forming a leaf-sheath. 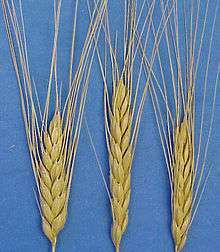 With ca 780 genera and around 12,000 species, Poaceae are the fifth-largest plant family, following the Asteraceae, Orchidaceae, Fabaceae and Rubiaceae. Grasslands such as savannah and prairie where grasses are dominant are estimated to constitute 40.5% of the land area of the Earth, excluding Greenland and Antarctica. Grasses are also an important part of the vegetation in many other habitats, including wetlands, forests and tundra. 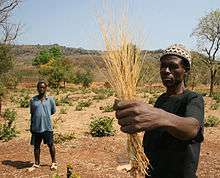 The Poaceae are the most economically important plant family, providing staple foods from domesticated cereal crops such as maize (corn), wheat, rice, barley, and millet as well as forage, building materials (bamboo, thatch, straw) and fuel (ethanol). Though commonly called "grasses", seagrasses, rushes, and sedges fall outside this family (see Grass (disambiguation)). 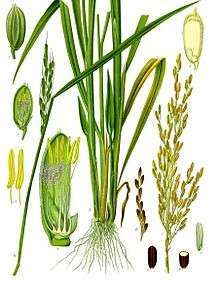 The rushes and sedges are related to the Poaceae, being members of the order Poales, but the seagrasses are members of order Alismatales. 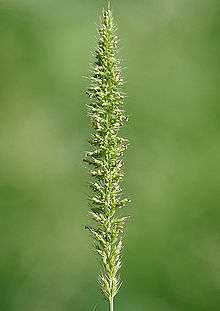 The name Poaceae was given by John Hendley Barnhart in 1895,:7 based on the tribe Poeae described in 1814 by Robert Brown, and the type genus Poa described in 1753 by Carl Linnaeus. 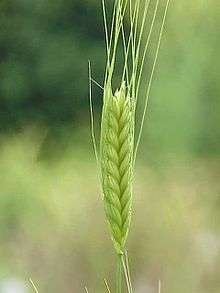 The term is derived from the Ancient Greek πόα (póa, “fodder”). 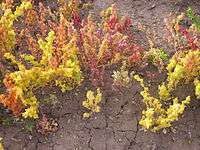 Prior to 2005, fossil findings indicated that grasses evolved around 55 million years ago. Recent findings of grass-like phytoliths in Cretaceous dinosaur coprolites have pushed this date back to 66 million years ago. 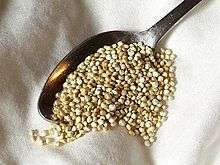 In 2011, revised dating of the origins of the rice tribe Oryzeae suggested a date as early as 107 to 129 Mya. A multituberculate mammal with "grass-eating" adaptations seems to suggest that grasses were already around at 120 mya. 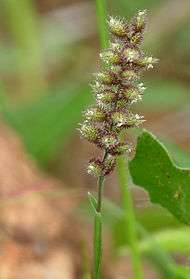 The grass family is one of the most widely distributed and abundant groups of plants on Earth. Grasses are found on almost every continent, and are absent only from Antarctica. 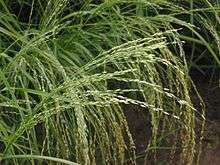 Grasses are, in human terms, perhaps the most economically important plant family. 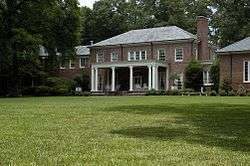 Their economic importance stems from several areas, including food production, industry, and lawns. 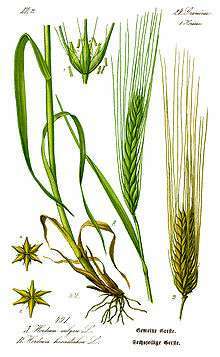 They have been grown as food for domesticated animals for up to 6,000 years and the grains of grasses such as wheat, rice, maize (corn) and barley have been the most important human food crops. Grasses are also used in the manufacture of thatch, paper, fuel, clothing, insulation, timber for fencing, furniture, scaffolding and construction materials, sports turf, and baskets. 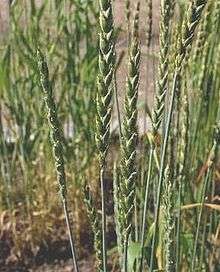 Agricultural grasses grown for their edible seeds are called cereals or grains (although the latter term, agriculturally, refers to both cereals and legumes). 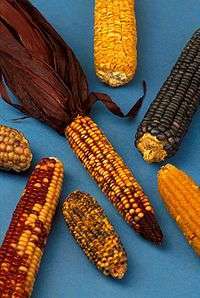 Three cereals – rice, wheat, and maize (corn) – provide more than half of all calories eaten by humans. 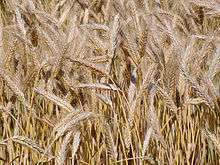 Of all crops, 70% are grasses. 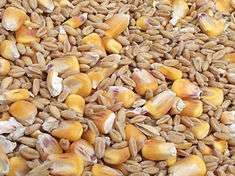 Cereals constitute the major source of carbohydrates for humans and perhaps the major source of protein, and include rice in southern and eastern Asia, maize in Central and South America, and wheat and barley in Europe, northern Asia and the Americas. Sugarcane is the major source of sugar production. Additional food uses include sprouted grain, shoots, rhizomes and sugar), drink (sugarcane juice, plant milk, rum, beer, whisky, vodka). 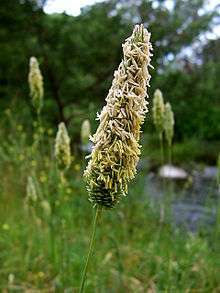 Many species of grasses are grown as pasture for forage and fodder for livestock, particularly for sheep and cattle. 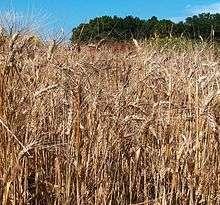 They may be cut and stored in the form of hay, straw or silage for use during the winter. Hay and straw are used for animal bedding. Forms of grass are used to cover baseball fields, like this one in Citi Field, home of the Mets. Grass playing fields, courses and pitches are the traditional playing surfaces for many sports, such as American football, Association football, baseball, cricket, and rugby and golf. 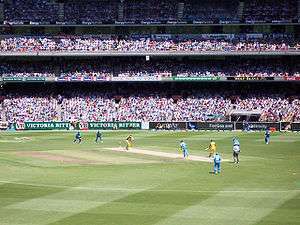 Sports such as golf, tennis and cricket are particularly dependent on the quality of the grass on which the sport is played. In some sports facilities, including indoor domes and other places where maintenance of a grass field would be difficult, grass may be replaced with artificial turf, a synthetic grass-like substitute. In tennis, grass is grown on very hard-packed soil, and the bounce of a tennis-ball may vary depending on the grass's health, how recently it has been mowed, and the wear and tear of recent play. The surface is softer than hard courts and clay (other tennis surfaces), so the ball bounces lower, and players must reach the ball faster resulting in a different style of play which may suit some players more than others. The world's most famous grass tennis is Centre Court at Wimbledon in England, home of the Wimbledon Championship. In Ward Moore's novel Greener Than You Think, the world is slowly taken over by unstoppable Bermuda Grass. 1 2 Piperno, Dolores R.; Sues, Hans-Dieter (2005). "Dinosaurs Dined on Grass". Science. 310 (5751): 1126–8. doi:10.1126/science.1121020. PMID 16293745. ↑ HASTON, ELSPETH; RICHARDSON, JAMES E.; STEVENS, PETER F.; CHASE, MARK W.; HARRIS, DAVID J. (October 2009). "The Linear Angiosperm Phylogeny Group (LAPG) III: a linear sequence of the families in APG III". Botanical Journal of the Linnean Society. 161 (2): 128–131. doi:10.1111/j.1095-8339.2009.01000.x. ↑ Christenhusz, M.J.M. ; Byng, J.W. (2016). "The number of known plants species in the world and its annual increase". 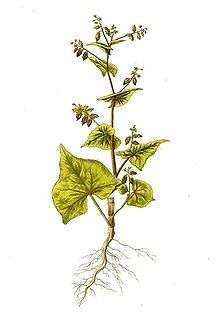 Phytotaxa. Magnolia Press. 261 (3): 201–217. doi:10.11646/phytotaxa.261.3.1. ↑ "Angiosperm Phylogeny Website". Retrieved 20 March 2016. ↑ Reynolds, S.G. "Grassland of the world". www.fao.org. Retrieved 2016-10-04. ↑ Barnhart, John Hendley (15 January 1895). "Family nomenclature". Bulletin of the Torrey Botanical Club. Lancaster, PA, USA. 22 (1): 1–24. Retrieved 5 June 2016. ↑ Piperno, Dolores R.; Sues, Hans-Dieter (18 November 2005). "Dinosaurs Dined on Grass". Science. 310 (5751): 1126–1128. doi:10.1126/science.1121020. PMID 16293745. ↑ Grass Phylogeny Working Group II (2012). "New grass phylogeny resolves deep evolutionary relationships and discovers C4 origins". New Phytologist. 193 (2): 304–312. doi:10.1111/j.1469-8137.2011.03972.x. PMID 22115274. ↑ Prasad, V.; Stroemberg, C.A.E. ; Alimohammadian, H.; Sahni, A. (2005). 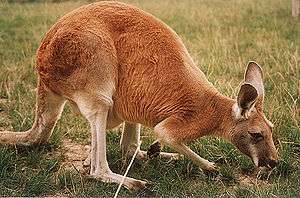 "Dinosaur coprolites and the early evolution of grasses and grazers". Science. 310 (5751): 1177–1180. doi:10.1126/science.1118806. PMID 16293759. ↑ Prasad, V.; Strömberg, C.A. ; Leaché, A.D.; Samant, B.; Patnaik, R.; Tang, L.; Mohabey, D.M. ; Ge, S.; Sahni, A. (2011). 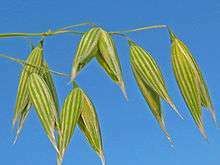 "Late Cretaceous origin of the rice tribe provides evidence for early diversification in Poaceae". Nature Communications. 2: 480. doi:10.1038/ncomms1482. PMID 21934664. ↑ Wu, Z.Q. ; Ge, S. (2012). "The phylogeny of the BEP clade in grasses revisited: Evidence from the whole-genome sequences of chloroplasts". Molecular and Phylogenetic Evolution. 62 (1): 573–578. doi:10.1016/j.ympev.2011.10.019. 1 2 3 4 5 6 7 8 9 10 11 Cope, T.; Gray, A. (2009). Grasses of the British Isles. 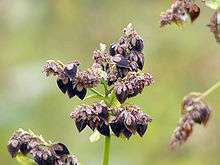 London, U.K.: Botanical Society of Britain and Ireland. ISBN 9780901158420. ↑ Clayton, W.D. ; Renvoise, S.A. (1986). 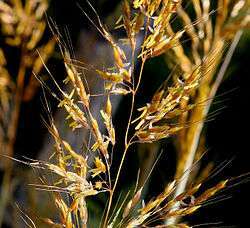 Genera Graminum: Grasses of the world. London: Royal Botanic Garden, Kew. ISBN 9781900347754. 1 2 Attenborough, David (1984). The Living Planet. British Broadcasting Corporation. ISBN 0-563-20207-6. ↑ Sarandón, Ramiro (1988). 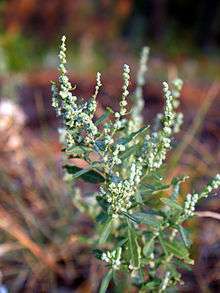 "Biología poblacional del gramon (Cynodon spp., Gramineae)": 189. Retrieved 22 April 2014. ↑ "Angiosperm phylogeny website". Retrieved 2007-10-07. 1 2 George Constable, ed. (1985). Grasslands and Tundra. Planet Earth. Time Life Books. p. 20. ISBN 0-8094-4520-4. ↑ "Chapter 1: How grasses grow". Farmwest.com. Retrieved 2013-08-26. ↑ Soreng, Robert J.; Peterson, Paul M.; Romschenko, Konstantin; Davidse, Gerrit; Zuloaga, Fernando O.; Judziewicz, Emmet J.; Filgueiras, Tarciso S.; Davis, Jerrold I.; Morrone, Osvaldo (2015). "A worldwide phylogenetic classification of the Poaceae (Gramineae)". Journal of Systematics and Evolution. 53 (2): 117–137. doi:10.1111/jse.12150. ISSN 1674-4918. ↑ Raven, P.H. ; Johnson, G.B. (1995). Carol J. Mills, ed. Understanding Biology (3rd ed.). WM C. Brown. p. 536. ISBN 0-697-22213-6. ↑ George Constable, ed. (1985). Grasslands and Tundra. Planet Earth. Time Life Books. p. 19. ISBN 0-8094-4520-4. ↑ Matthew J. Lindstrom, Hugh Bartling, Suburban sprawl: culture, theory, and politics (2003), p. 72, quoting Virginia Scott Jenkins, The Lawn: A History of an American Obsession (1994), p.21. ↑ Paul Robbins and Julie T. Sharp, "Producing and Consuming Chemicals: The Moral Economy of the American Lawn", Economic Geography 79:4 (2003), p. 425-45; reprinted in William G. Moseley, David A. Lanegran, Kavita Pandit, The Introductory Reader in Human Geography (2007), p. 323-36. ↑ "Lawn Sprinkling Regulations in Metro Vancouver, BC, Canada". Metrovancouver.org. 2011-02-21. Retrieved 2013-08-26. ↑ "hexenal". School of Chemistry, University of Bristol. Retrieved 2013-08-26. ↑ Olmert, Michael (1996). Milton's Teeth and Ovid's Umbrella: Curiouser & Curiouser Adventures in History, p. 208. Simon & Schuster, New York. ISBN 0-684-80164-7. ↑ For publication details of "Save the Reaper" by Alice Munro see List of short stories by Alice Munro. ↑ Miller, Judith Maclean (Spring 2002). "Deconstructing Silence: The Mystery of Alice Munro". Antigonish Review (129). pp. 43–52.